Taking a glance at a zygomatic dental implant, this type of implant looks like a very long traditional implant. The actual difference between the two is the diameter, the length and most importantly the angulations and placement. The reason why zygomatic Implants are longer is, because of the insufficient bone, they are placed up into the strong Zygoma bone (cheekbone). These implants ensure a sufficient foundation for a dental implant bridge to be placed. Typically 2 zygomatic implants are used along with 2-4 ordinary implants. If bone availability is even more limited, in some cases, four zygomatic implants may be used. If you have bone loss there are a few options that your dental surgeon may be able to perform to enable you to have dental implant treatment. However, this can only be evaluated on a case-by-case basis, dental implant treatment will not be suitable for everyone and there are different factors your dental surgeon will consider. 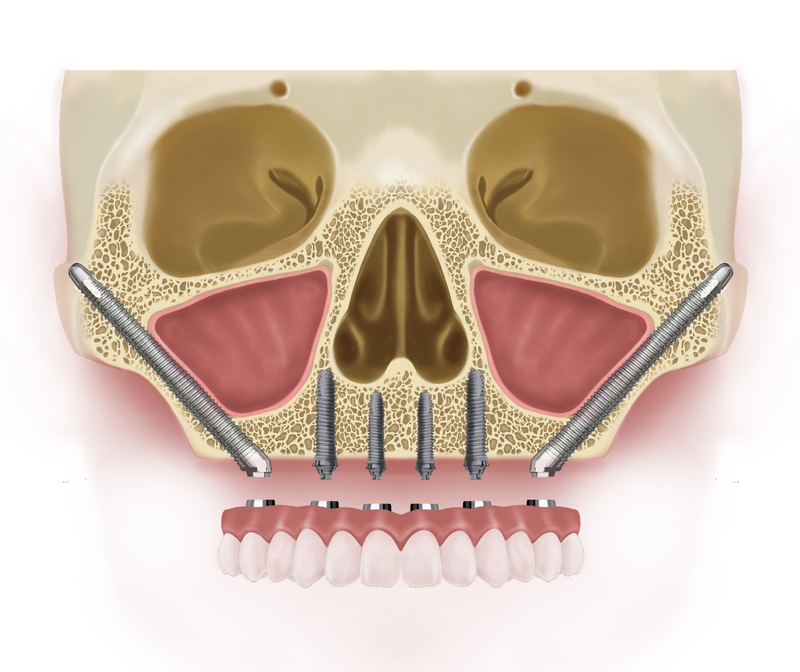 Zygomatic implants are an alternative to more invasive and complex procedures to regain bone in the jaw. Common procedures include Bone Grafting and Sinus Lift. Bone grafts, as well as sinus lifts, are additional surgeries, they are more invasive and do add additional healing times to treatment. Zygomatic implants can also (but not always) be used with the teeth in a day dental implant technique, meaning that dental implants can be immediately ‘loaded’ with a dental implant provisional bridge. Find out more about teeth in a day. Zygomatic implants have enabled many patients with severe bone loss, who may have even been told previously that they may not be able to have dental implant treatment, to be able to have a permanent solution to tooth loss. Tooth loss. When you lose a tooth the bone where your tooth used to be, recesses as there is nothing there to stimulate the bone to keep it alive. This is why tooth loss solutions such as dentures which sit on the gums may slow down but do prevent bone loss. Dental implants are one of the only procedures, which have been proven to prevent further bone loss as well as help improve speech, eating, retain face structure and more. Is everyone eligible for Zygomatic Implants? Unfortunately not. If a patient is looking for a dental implant supported bridge and they have bone loss or insufficient bone mass in the upper jaw, a dental surgeon, depending on other dental health factors, may suggest zygomatic implants. Zygomatic implants are used to support dental implant bridges. Ready To Find Out More About Zygomatic Implants?